If spirituality is about anything, it’s about waking up and paying attention – noticing our own lives, for which the first step is noticing how often we aren’t noticing our own lives. Attention includes attention to money. First, make a budget. If at your house, there is a precise monthly budget, and you keep track of every dollar spent and what budget category it falls under, then you are doing a wonderful spiritual practice of noticing your life and what it is for. Making a budget and knowing where and when you exceed it really is a deep spiritual practice of paying attention to your life. The important point is to do two things at the end of every month: (1) compare your actual spending to what you budgeted for that month -- make note of which line items you stayed within and which ones you exceeded, and (2) make a budget for the next month. Whether or not you actually do stick to your budget might or might not be so important, depending on your financial situation. In some situations, making and keeping a budget is a crucial financial practice. Even if, for you, budgeting might not be a financial necessity, it is a spiritual practice of being mindful how your resources are deployed to do good to yourself and others. 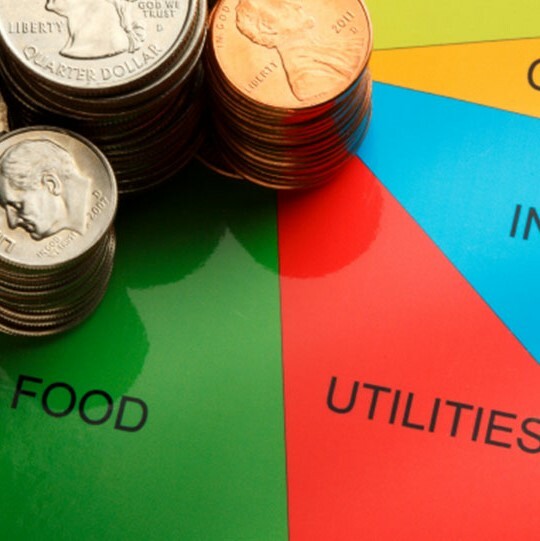 Awareness of which line items are consistently over or under budget presents you with the question: Do you want to adjust your budget or adjust your spending? Which adjustment will be most conducive to your and the world's flourishing? That's an important and a spiritual question for reflection -- a key question for living intentionally. But you can't begin to address that question until you're making a budget and comparing your spending to it. Second, as you review at the end of each month how your actual spending compared to your budget for that month, take that opportunity to reflect on what your spending on yourself did for you that month. Every "outgo" (you know, the opposite of "in-come") that isn't saving or donating is spending on yourself (or your family). Then the question for each such expense is: "Is this really helping me/the family? What spending is helping me/us be happy, improving my/our overall well-being, and what really isn’t? Am I spending more than what’s doing me/us any good?" Maybe your next budget can begin shifting some money out of the spending categories and into one of the two other categories: saving and giving. It’s amazing how willing human beings are to keep buying stuff that not only isn’t helping them be any happier, but is actually making them unhappy. Studies show that as we become less materialistic, our well-being improves, and that as our well-being improves we become less materialistic. It’s a spiritual practice of health and joy to intentionally assess whether the spending on yourself is helping – and how much of it is harmful habits that are only weighing you down. In particular, if that spending has been leading to debt, then it’s a double-killer: you carry the burden of the debt and of the materialism. Third, as you draft each budget, think about whether it would work for you to give away more. What’s your money for? It’s for doing good in the world. Take care of yourself – which includes not spending on what you don’t need – and give away the rest. I like the website givewell.org for rating charities for maximum effectiveness for every dollar you give. There are two categories of charity and social good organizations: (1) those that directly help people who are suffering, and (2) those that work for systemic change, reforming the systems that create suffering. Giving food to the hungry doesn’t address the need to change the system that leaves people hungry. At the same time, supporting systemic change so that eventually everyone will be able to feed themselves doesn’t feed any of the people who are hungry right now. So my suggestion would be dividing your charitable giving evenly between those two categories. Fourth, for saving and giving, think in terms of percents. What percent of your total income can you save? What percent can you, or do you want to, give away? A good starter guideline is 10-10-80. Save 10 percent. Give away 10 percent. Live on the other 80 percent. 10-10-80. Certainly at different phases of life, and at different income levels, those percentages need to be different. Maybe you can afford to be giving away 20 percent. Or 50 percent. Don’t be stuck on 10 percent giving if you have open to you the possibilities of giving away much higher percents. There is such amazing joy in that – don’t hold yourself back if you don’t need to. Or maybe saving 10 percent is too much because your retirement is as set as it needs to be, and you have no debts, and your kids' inheritance is already as substantial as it needs to be. (A little inheritance is nice, but a big inheritance may take from your kids the benefits that come from facing tough challenges. Large inheritance doesn't, in fact, do the recipient any favors, though they may not know that at the time.) In some circumstances, saving 10 percent is too much. Don’t be stuck on that 10 percent either. But as a beginning point for being intentional about who you are in the world, what your resources stand for, try 10-10-80. Try living into 10-10-80 for a year or so and then see what adjustments would be fulfilling, given your position. Spirituality is a path – it’s a path of awareness and intentionality, of waking up to ourselves and what we are and what we’re doing instead of being pulled along by unexamined habits and impulses. Spirituality of money recognizes that what we do and are includes what we do and are with our resources. Budgeting is a spiritual practice! A spiritual practice is one where you consciously choose to tune in to and follow the guidance of your higher self. When you are spending money unconsciously, you are following the whims of your unconscious urges, you are at the mercy of your ungrounded fantasies, your wounded ego or your victim mentality. By consciously tracking your spending, earnings and planning where you money is going to go to serve your highest values and callings in life, it become seriously spiritual.